What are osteomyelitis symptoms and signs? How do health care professionals diagnose osteomyelitis? What is the prognosis for osteomyelitis? Osteomyelitis is an infection of bone that can occur in any age group. Treatment of osteomyelitis can include antibiotics, splinting, or surgery. Causes of osteomyelitis include bacteria in the bloodstream from infectious diseases that spread to the bone, an open wound from a trauma over a bone, and recent surgery or injection in or around a bone. The most common types of bacteria that cause osteomyelitis are Staphylococcus, Pseudomonas, and Enterobacteriaceae. Risk factors for developing osteomyelitis include a weakened immune system due to a medical condition or medications, cancer, chronic steroid (cortisone) use, sickle cell disease, human immunodeficiency virus (HIV), diabetes, hemodialysis, intravenous drug users, infants, and the elderly. Symptoms of osteomyelitis vary. In children, osteomyelitis symptoms may include pain or tenderness over the affected bone, difficulty or inability to use the affected limb or to bear weight or walk due to severe pain, fever, chills, and redness at the site of the infected area. In adults, the symptoms of osteomyelitis include fever, chills, irritability, swelling or redness over the infected bone, drainage of pus, stiffness, and nausea. Physicians diagnose osteomyelitis with a medical history, physical examination, blood tests, imaging studies (X-rays, bone scans, CT scans, MRIs, and ultrasounds), and sometimes a biopsy of the bone. Treatment for osteomyelitis usually includes antibiotics and pain medications. Sometimes the patient may need surgery. The prognosis for osteomyelitis is good with early diagnosis and appropriate treatment. Patients can make a full recovery without lasting complications. Delayed treatment or significant bone and soft tissue injury can lead to long-term problems and even deformity. Osteomyelitis is infection in the bone. Osteomyelitis can occur in infants, children, and adults. Different types of bacteria typically affect the different age groups. In children, osteomyelitis most commonly occurs at the ends of the long bones of the arms and legs, affecting the hips, knees, shoulders, and wrists. In adults, it is more common in the bones of the spine (vertebral osteomyelitis), feet, or in the pelvis. There are several different ways to develop the bone infection of osteomyelitis. The first is for bacteria to travel through the bloodstream (bacteremia) and spread to the bone, causing an infection (hematogenous osteomyelitis). This most often occurs when the patient has an infectious disease elsewhere in the body, such as pneumonia, an abscessed tooth, or a urinary tract infection that spreads through the blood to the bone. An open wound from a trauma (post-traumatic wound) over a bone can lead to osteomyelitis. This happens most commonly with underlying peripheral vascular disease, peripheral neuropathy, or diabetes mellitus. With an open fracture (compound fracture), bacteria may come in contact with the bone that punctures through the skin. This increases the risk of osteomyelitis. A recent surgery or injection in or around a bone can also expose the bone to bacteria and lead to periostitis, an infection of the surface membrane of the bone. This can worsen and affect the whole bone, leading to osteomyelitis. The most common types of bacteria that cause osteomyelitis are Staphylococcus (including methicillin-resistant Staphylococcus aureus or MRSA), Pseudomonas, and Enterobacteriaceae. Less commonly, gram-negative bacteria causes osteomyelitis. Patients with conditions or taking medications that weaken their immune system are at a higher risk of developing osteomyelitis. Risk factors include cancer, chronic steroid use, sickle cell disease, human immunodeficiency virus (HIV), diabetes, hemodialysis, intravenous drug users, infants, and the elderly. Signs and symptoms of osteomyelitis can vary greatly. In children, osteomyelitis most often occurs more quickly. Osteomyelitis in children is most likely caused by bacteria that travel through the bloodstream (bacteremia) and spread to the bone. Hematogenous osteomyelitis is the medical term for the spread of bacteria through the blood to infect the bone. Children often develop pain or tenderness over the affected bone, and they may have difficulty or inability to use the affected limb or to bear weight or walk due to severe pain. They may also have fever, chills, and redness at the site of the infected area. In adults, the symptoms and signs often develop more gradually and include fever, chills, irritability, swelling or redness over the infected bone, drainage of pus, stiffness, and nausea. In people with diabetes, peripheral neuropathy, or peripheral vascular disease, there may be no pain or fever. The only sign may be an area of skin breakdown that is worsening or not healing. In osteomyelitis of the spine (vertebral osteomyelitis) or the spinal discs (discitis), the only symptom may be back pain. Acute osteomyelitis occurs with a rapid onset, and pain, fever, and stiffness usually accompany this quick onset. It generally occurs after a break in the skin from injury, trauma, surgery, orthopedic procedures (especially ones involving bone hardware or fixators), joint infection, or skin infection from wounds such as a foot wound or ulceration. Chronic osteomyelitis is insidious (slow) in onset. It may be the result of a previous infection of osteomyelitis. Despite multiple courses of antibiotic therapy, it may reoccur. Symptoms and signs of chronic osteomyelitis are subtle but may include fever, pain, redness, or discharge at the site of infection. The diagnosis of osteomyelitis begins with a complete medical history and physical examination. 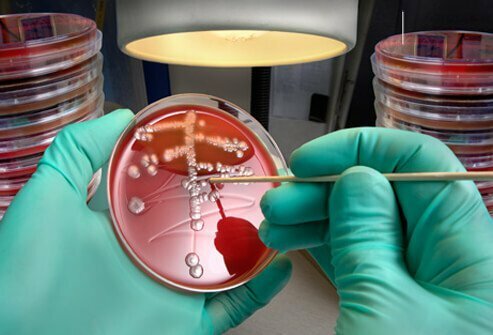 During the medical history, the doctor may ask questions about recent infections elsewhere in the body, past medical history, medication usage, and family medical history. The physical examination will look for areas of tenderness, redness, swelling, decreased or painful range of motion, and open sores. The doctor may then order tests to help diagnose osteomyelitis. Several blood tests help determine if there is an infection present. These include a complete blood count (CBC), the erythrocyte sedimentation rate (ESR), C-reactive protein (CRP), and blood cultures. None of these is specific for osteomyelitis but they can suggest that there may be some infection in the body. Health care professionals usually obtain imaging studies of the involved bones. These can include plain radiographs (X-rays), bone scans, computed tomography (CT) scans, magnetic resonance imaging (MRIs), and ultrasounds. These imaging studies can help identify changes in the bones that occur with osteomyelitis. After a physician identifies an area of bone with possible osteomyelitis, a biopsy of the bone may be obtained to help determine precisely which bacteria are involved, and the culture of this can indicate the best choice for antibiotic treatment. In many cases, antibiotics and pain medications effectively treat osteomyelitis. If a doctor obtains a biopsy, this can help guide the choice of the best antibiotic. The duration of treatment of osteomyelitis with antibiotics is usually four to eight weeks but varies with the type of infection and the response to the treatments. In some cases, the doctor will immobilize an affected area with a brace to reduce the pain and speed the treatment. Sometimes, surgery may be necessary. If there is an area of localized bacteria (bone abscess) or joint infection (septic arthritis), a doctor may need to open, wash, and drain it. If there is damaged soft tissue or bone, this may need to be removed (debridement). If it's necessary to remove bone, it may need to be replaced with bone graft or stabilized during surgery. With early diagnosis and appropriate treatment, the prognosis for osteomyelitis is good. A patient will need to adhere to antibiotics regimes for four to eight weeks and sometimes longer in the treatment of osteomyelitis depending on the bacteria that caused it and the response of the patient. Commonly, patients can make a full recovery without longstanding complications. However, if there is a long delay in diagnosis or treatment, or if there is significant bone and soft tissue injury due to trauma with compromised local blood supply, it can lead to long-term permanent functional deficits and/or make the patient more prone to reoccurrence. If it's necessary to perform surgery, debridement, or bone grafting, this will prolong the time it takes to recover. Christian, S., Kraas, J., Conway, W.F. "Musculoskeletal Infections." Semin Roentgenol 42 (2007): 92-101. Hartwig, N.G. "How to Treat Acute Musculoskeletal Infections in Children." Adv Exp Med Biol 582 (2006): 191-200. King, Randall W. "Osteomyelitis in Emergency Medicine." Medscape.com. July 27, 2011.<http://emedicine.medscape.com/article/785020-overview>. Krogstad, Paul. "Hematogenous osteomyelitis in children: Management." June 2018. UpToDate.com. <https://www.uptodate.com/contents/hematogenous-osteomyelitis-in-children-management>. Lalani, Tahaniyat. "Overview of osteomyelitis in adults." June 2018. UpToDate.com. <https://www.uptodate.com/contents/overview-of-osteomyelitis-in-adults?search=Osteomyelitis&source=search_result&selectedTitle=1~150&usage_type=default&display_rank=1>. Sia, I.G., Baebari, E.F. "Infection and Musculoskeletal Conditions: Osteomyelitis." Best Pract Res Clin Rheumatol 20 (2006): 1065-1081. What were the symptoms of your osteomyelitis? Please describe your experience with osteomyelitis. What was the treatment for your osteomyelitis? How was your osteomyelitis diagnosed? Stitches or sutures are used to close skin wounds. After the wound is examined and cleaned, the health-care provider assesses the wound to decide how to repair the wound. Dissolvable stitches may be used if deep sutures are necessary. Nylon and polypropylene are the main choices of suture material. The length of time stitches must remain in place depends upon the location of the wound and how much stress is placed on the wound.